As part of my practice of medicine class, we were assigned to visit patients with chronic conditions in their homes and talk to them. I and two other classmates visited an incredibly engaging middle aged man with a rather serious condition (that’s rare enough that I don’t feel comfortable disclosing it here) that he and his brother inherited from their father, and that he has passed on to his two children. It is not an immediately fatal disease, and with highly vigilant management, they will die with the disease and not from it. One of the many things that we talked about that struck me, was the online network of sufferers of this disease and other similar ones. After his diagnosis, and through to the present, it has been an incredibly valuable source of support for him, and it really is an amazing thing. When once he and his family would likely never meet anyone else with the condition, or certainly not more than a small handful, now he can talk to people all over the world about it from the comfort of his home. I couldn’t help but wonder though; where are the doctors in this? Our patients are comparing notes and experiences, and certainly we do not belong in every facet of their lives, but aren’t we, by definition, a part of their support network too? 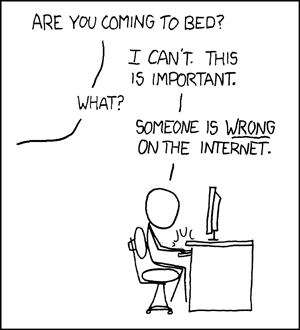 I recently read this blog post about how Doctors have a duty to engage in social media online, and I do agree. There is so much misinformation out there, and we really can’t do anything to change the fact that unless it’s an emergency (and sometimes even if it is) people’s will often first look things up online. As medical professionals, this can be incredibly frustrating, especially when patients have a closed attitude and don’t trust their doctors. On the other hand, as patients, it can also be frustrating when doctors are immediately dismissive. There are many different things that lead up to the unfortunate situation of patient not trusting doctor’s information over the internet, and doctor completely dismissing patient’s stance because it is internet fueled, and I’m not about to tackle them all in one post. One simple, concrete thing that medical professionals can do (so yes, not just Doctors) is to have a stronger online presence. Annoyed at the information your patients are finding online about vaccinations? Post some more credible information. Search rankings are a fluid, ever changing thing, and with work, maybe when people search, they’ll find information that you feel better about them reading. But not only is there a problem of misinformation, but there is also a disconnect between us and our patients. We cannot hide behind a paternalistic, distanced mask. Don’t you think our patients would feel better about vaccinations if they realize that we too vaccinate our children? That yes, maybe we’re also a little bit worried but the benefits far outweigh the risks? Maybe they think we don’t care about our patients, or maybe they don’t even realize what it takes for us to become medical professionals, and how much time and effort and money goes into training us. And maybe it would help people to be a little less scared of doctors. A little less defensive against us. There is a wide variety of negative attitudes out their toward us, and it might be good for us to work on changing their prevalence. I don’t think the future is doctors (and/or other medical professionals) being available on call online, or frequently emailing our patients or being facebook friends with them. I don’t think it is necessarily our place to be a part of the online systems for sufferers of various diseases, because they need their own safe space. But we should be here, and we should be visible. Hopefully this blog is me doing my part. It’s easy to forget that how varied the path post (and pre) MD is. I had the opportunity to participate in a lunch talk with Dr. Gretchen Berland, an Internal Medicine doctor who also happens to make documentaries (and who had a career in the industry before going to medical school). Her most recent documentary is Rolling, which follows three wheelchair bound individuals. Part of what’s different about her work is that instead of following her subjects around with a camera crew, she instead gives them the camera and allows them to choose when and how and where and why and who to film. She’s an incredibly interesting person and I find her career path and her work rather fascinating (I really want to find and watch Cross Cover, which is about Residents newly experiencing being on call overnight), so I could easily write an entry all about her, but that’s not what I’m going to do. There is so much one can do with an MD. It’s easy to either outright forget that there are so many different creative options, or to get so lost and overwhelmed with the possibilities that you just have to ignore their existence. I oscillate between the two, but I think for me a large part of the problem is that I have yet to merge my interests outside of medicine with the idea of my eventual medical career. And they don’t have to intersect, I know, but it’s nice if they do, and even if they don’t, they need to co-exist. I really need to write entries the day I get the idea, because I know I had somewhere concrete to go with this post and yet now as I write I can’t quite remember what it was. I’ve lost the creative window within which this could have been a solid post. Perhaps I can salvage it but I am currently doubtful. I remember once, as a child or a young teenager, being upset at the realization that there are probably lots of books that I will never even have the option of reading because they will never be translated into a language I know. I am fascinated by stories; all kinds of them and all aspects of their telling. I love tv shows, movies, books, comics, plays, music, musicals, listening to people talk, etc. I am fascinated by blogs and youtube and twitter and facebook. I greatly enjoy participating in theater productions (off the stage; I hate acting) and while I am terrible at telling stories out loud, I have relative talent when it comes to writing. And it’s not really plots that I love. It’s people/characters. This is why I was going to become a Clinical Psychologist. This is why, introverted and easily exhausted by people as I am, I want to go into a specialty where I get to interact with them, maybe where I have long term patients I can get to know. The stories. People have stories, people are stories, and I want to listen. But I also want to tell stories. The urge persists. Medicine has done little (so far, and it is very early) to erode my desire to identify as a writer, and I’m glad. Still, I need to do something with it, and it’s good to have it re-affirmed that I can, and while still seeing patients. This week marks halfway through my first semester of medical school. Anatomy lab is divided into thirds, but my other classes are bisected and this is our exam week. I’m still overall content with my decision to come to medical school, and more specifically, with my particular school. I like my classmates, and my classes and my professors. There’s things I’d change but education’s one of those things that needs constant reworking and evolution (like our online system… It’s a little upsetting to know that it won’t be changed till I’m in my clinical years, but it is good to know that they know it’s a problem and are working on it). I also still like this city, and my apartment, and I’m getting along well with my roommate (we were friends before but had never lived together). While in general, anatomy lab feels like “just another day in anatomy lab,” there is always something new to react to. I think (I hope) it takes a while to become completely jaded about dissecting a dead human. The sight of his hands uncovered deeply bothers one of my lab partners, and I admit that I do sometimes get a tiny bit of a chill when I see his hands, his feet, or his face (their heads are covered but I peeked under the covering yesterday, to see if it would affect me as much as seeing his head at all did the first time I stopped into lab before we started dissecting). His head and face I expected to be disturbing, but I had no idea how much hands and feet are connected to our idea of human, of person. We cut off Frank’s right leg the other day, and that was… bizarre. I did the final cuts of soft tissue with a scalpel, essentially hacking through the not-bone that remained in our way. It felt like butchering, a feeling missing from lab since we cracked open his ribs to open his thoracic cavity. I must say though, I am glad to be done with the pelvis and perineum and I really hope the limbs are more enjoyable to dissect. One would think the pelvis and perineum might be much more interesting dissections, but they’re just not. From the rear approach there’s way too much fat to get through, and from the forward approach there’s a lot of vague structures. I miss the thorax and the abdomen, with their obvious organs. Yup, that is definitely a kidney, and I’m willing to bet that’s a lung. I still really like lecture though, when I’ve been going. Missed a few these past few weeks but hoping to get back on track after this week of exams. I really enjoy the clinical lectures we have in general, and especially the anatomy ones. We had a guest lecture on Urology that was surprisingly fun. Who knew urology was actually a rather interesting field? On the other side, I’m rather shocked by how little I like biochemistry. I shouldn’t be shocked. I rather disliked my intro to molecular, cellular and developmental biology class, and I wasn’t a huge fan of the more cell biology/biochem aspects of the others I took (that makes it sound like I took many. I didn’t. I took Intro to Ecology Evolution and Behavior, Reproductive Biology, Genetics, and Reaction to Injury, and three of the associated labs). This is part of why I initially didn’t want to come to medical school. I’m really not a huge fan of biology and how can you want to be a doctor but not like biology? I think it’s different though, liking biology and liking medicine. There’s overlaps, of course, but they’re still different fields. And as soon as biology becomes just a step or two higher level ( on the scale from cell to person), I start to tune in. This is important because this is the pathway for this disease? Ohhh. Ok. Maybe I’ll commit it to memory then. In general, it’s a struggle convincing myself to study for biochem. I just don’t want to know this stuff, and it’s really hard to learn what you don’t care to know. I think I’ll enjoy the second half of our biochem course a lot more. I’ve touched on these subjects before and I remember more about them still. I just really hope I passed this midterm today because I don’t want to have to study this again, and I don’t want to have to take that test again. That was not a fun test taking experience, and yes, test taking can be fun. At the very least, it can not feel like a chore. A good test experience feels challenging, but not a struggle, and I don’t mind checking my work. An unpleasant test taking experience ranges from being boring to feeling hopeless and futile, and making me go back and check my work feels like a daunting, annoying task. I feel I should add that I don’t think this is the fault of the teacher. I think the course is fairly well run and I really like her both as a person and as a professor. I just don’t really like biochem, much like I just didn’t like organic chemistry, and I just don’t like math either (but I enjoyed physics; obviously, I am a fan of applied sciences and not of the foundations). Still, so far so good. Looking forward to part two (of #???). Me spinning my fire staff. Partially as a birthday treat to myself, partially as a fun thing to do with my boyfriend and friends, and largely because, well, why not?, I spent this past weekend in the woods somewhere in New England at a spinning and fire arts training camp. Fire spinning (and spinning in general; the majority of the time one is not spinning props that are on fire) is something I picked up just over a year ago, and it’s been a hobby that I haven’t made quite as much time for as I would like to. Rather, I’m not as good at it yet as I’d like to be by now, and that requires putting in more time and effort. Spending this weekend around many talented people has joined together with many other recent events to create a big “Ah-ha!” moment. I really need to focus. I need to decide what it’s okay to not be very good at, and what I really want to be good at, and then I need to actually spend time on what’s important to me. I know I’ve said this before. I know I’ve thought this many, many times before, but I think I’m newly serious about it (for at least the next few weeks?). And they say it takes three weeks to form new habits, so maybe if I can keep it up for at least that long, I can really make it stick this time. I want to seriously work on staff (especially contact staff) and hooping (ie, hula hooping. I’m serious. It looks awesome in general and even cooler with an LED glow hoop or a fire hoop). I want to dabble in poi, but I’m not aiming for much. I want to read more often, but combined with my current determination to stop splurging on books (which meant I wasn’t reading enough and was essentially wasting money on books I often would only read once; I like the sound of reading more and spending less) means I need to stop being lazy about getting a public library card and also about figuring out my school’s library system. And I think I might allow myself to throw in a bit of gaming, because I do enjoy video games. I’m having trouble deciding where I stand on multiplayer games though, because I often find myself in a position of being either the least experience or one of the least experienced at a game, which then ends up being frustrating because I also tend to be less committed to putting in the time to get better/play more often. So I either need to make a concentrated effort to get better, or I need to stop so I don’t feel bad about not playing as often as everyone else, or I need to be comfortable with being really bad at the games (and worse than everyone else). At heart, I’m an RPG gamer. I can take my time making my decisions, it’s not competitive, and there’s a nice involving story so it’s almost like reading a book, just much more interactive and involved. I’m happy with where I am with dancing. Once a week ballroom dance club has been great. It’s nice and low key and just at the right level for me. I think the only thing I’m really missing if crafting, but I should be starting work on a baby blanket soon (expecting my first niece or nephew in November!) which will scratch that itch nicely. To top it all off, my boyfriend got me Wii Fit Plus for my birthday, so I’m really looking forward to that, especially after learning that I can finally create workout sets/routines instead of having to select each thing one at a time. New component to my morning routine? If I can get myself doing a half hour of yoga even just two or three times a week, I’ll be really happy with myself. And I need to balance this all with getting enough sleep (this is key! I’m actually really good about this during the week, but terrible on the weekends), and really working at my classes. I think I can do it, and I think I’ve made a decent effort so far. I just can’t let falling behind a little every now and then be an excuse to just let everything else fall apart, because it’s really easy to do that. Maybe in a month I’ll check in with how I’m doing so far. Hopefully I’ll do myself proud. I’m not looking to do everything every day, because that would be crazy. I know I just can’t put in as much time into any of these as I’d really like to, but I want to put in some time, because some is a lot better than none. I’m not looking to be an expert or a professional. I’m looking to keep myself happy, healthy and sane (and in some ways those are almost, but not quite, synonyms).